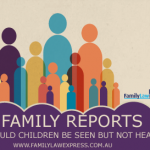 In producing a family report, the family consultant usually speaks to all significant parties involved in the case including the child/ren. How does such process likely affect the emotional well being of a child? Is it necessary for the child/ren to be included in such process?..